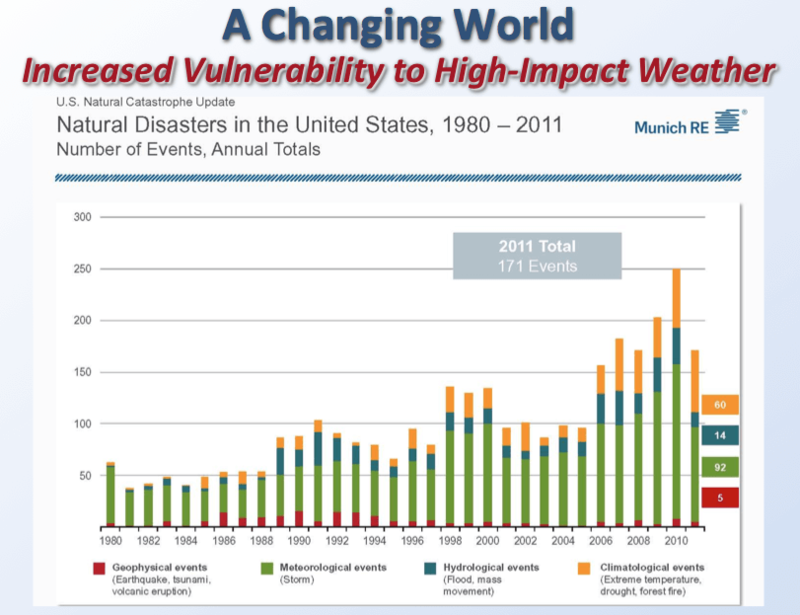 Home » Weather » Educational Topics in Meteorology » What is the Weather-Ready Nation Initiative? The United States is also home to the most frequent occurrence and the largest variety of extreme weather events of any other country in the world. These events include, but are not limited to, extreme heat/cold, snowstorms, tropical storms and hurricanes, droughts, areal and flash floods, hail storms, and tornadoes. 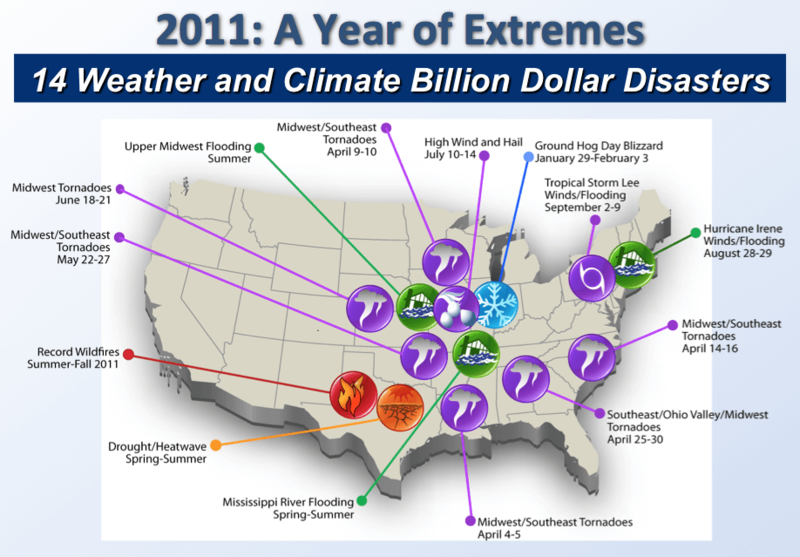 While none of this is new, it was the historic extreme weather events in 2011 that motivated NOAA to begin a dialog with the meteorological community about how to build a weather-ready nation. Ultimately, the services developed as a result of this program will help the public prepare for the impacts of, and mitigate loses caused by, high-impact weather events. 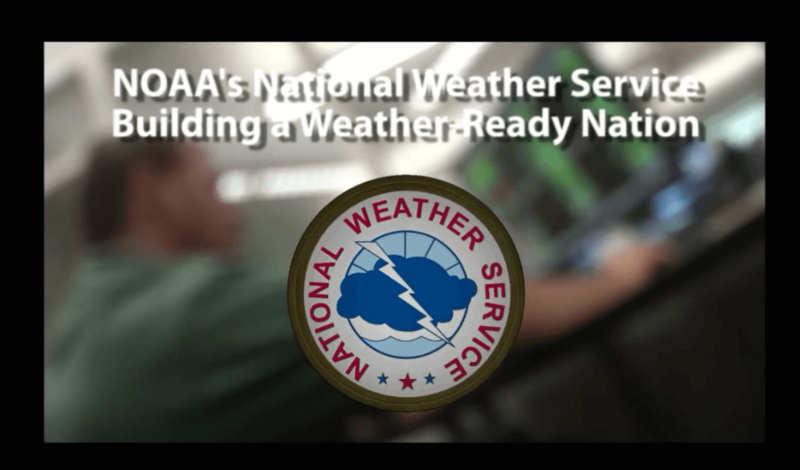 The National Oceanic and Atmospheric Administration (NOAA) has recognized iWeatherNet as an Ambassador of the NOAA Weather-Ready Nation (WRN) program. As part of the WeatherNet commitment to weather readiness, we have prepared a very brief overview of the WRN, to help explain the WRN mission. 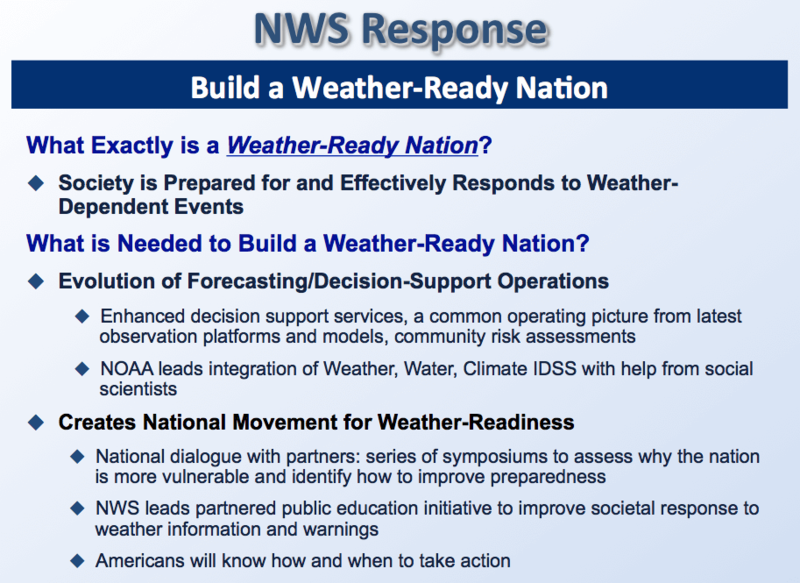 What Makes for a Weather Ready Nation? The WRN is an orchestrated effort to unite federal agencies, including the the National Weather Service, with private-sector entities, such as iWeatherNet, academia, the media, local/state officials, and emergency managers. This unification will improve overall disaster readiness through improved weather forecasts, more consistent and coherent warnings with a focus on impacts, and a stronger bridge between the operational and research communities. The entire concept of a “weather-ready nation” is about built on the premise of improving community resilience in the face of increasing vulnerability to weather disasters. The Weather Bureau (now known as The National Weather Service) was founded 145 years ago, in 1870. Forecasting was an emerging science at that time, and we are now on the forefront of cutting-edge, technological advancements never imagined by meteorologists of the mid-19th Century. NOAA is developing new decision support services, upgrading super-computing resources, making enormous investments in data assimilation and numerical modeling capabilities, improving radar and satellite technologies, and modernizing its dissemination methods (e.g., embracing the power of social media). Furthermore, the aforementioned unification with entities outside of NOAA/NWS will help to ensure that emergency managers, first responders, local and city officials, and the general public, receive consistent weather information with a focus on impacts. Ultimately, communities will be better prepared ahead of a significant-weather event and ready to respond expeditiously in the wake of a weather disaster. The main topic discussed was the need for improved meteorological understanding. This has the proposed effect of allowing for a better understanding of missed events and reducing the false alarm ratio. Another topic that was addressed as the forecast and warning process. Many of the workshop participants noted the need to improve the accuracy of forecasts. 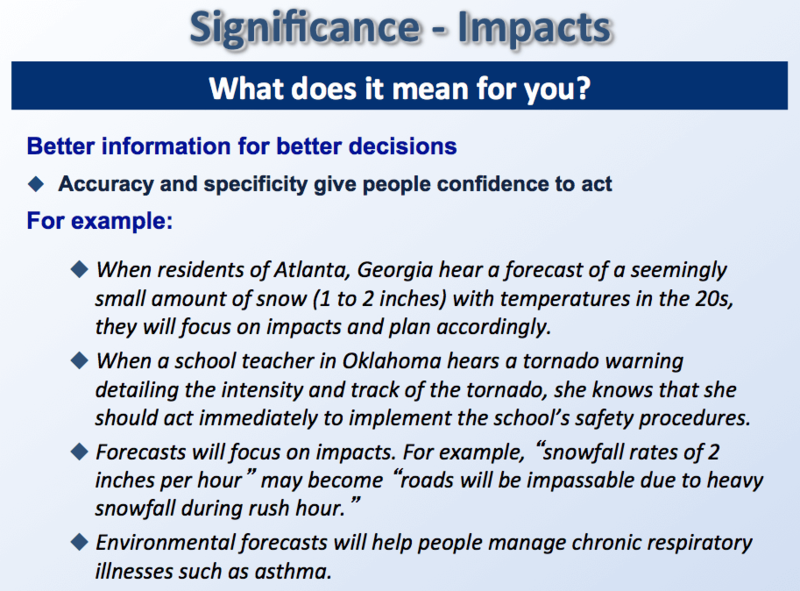 One of the largest aspects of this is behavioral research into the judgment and decision making of forecasts and how these aspects differ both among individual forecasters and NWS regions. 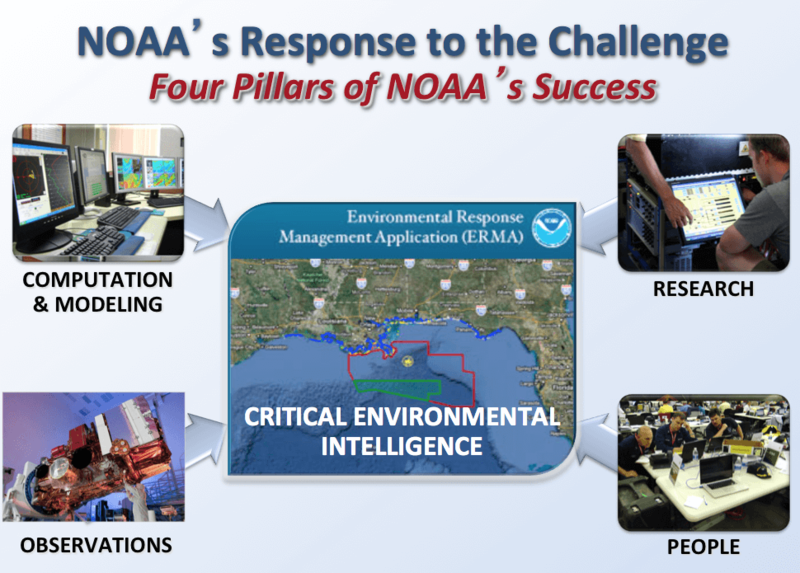 As part of the initiative, NOAA began to make changes to their agency’s operations. For instance, the dual polarization upgrade of the Doppler radars now enables forecasters to better track and forecast local high-impact weather events. Examples include the identification of severe thunderstorms, early detection of updraft rotation, hail formation and size, and more accurate determinations of winter precipitation type. These will ultimately make the warning process more efficient, precise, and accurate. The initiative also allows for new water resource management, weather, and climate prediction facilities that will utilize the latest radar, satellite, and atmospheric modeling technologies. These will allow for improved collaborative efforts among water, weather, and climate forecasters, ultimately leading to more timely and accurate forecasts. 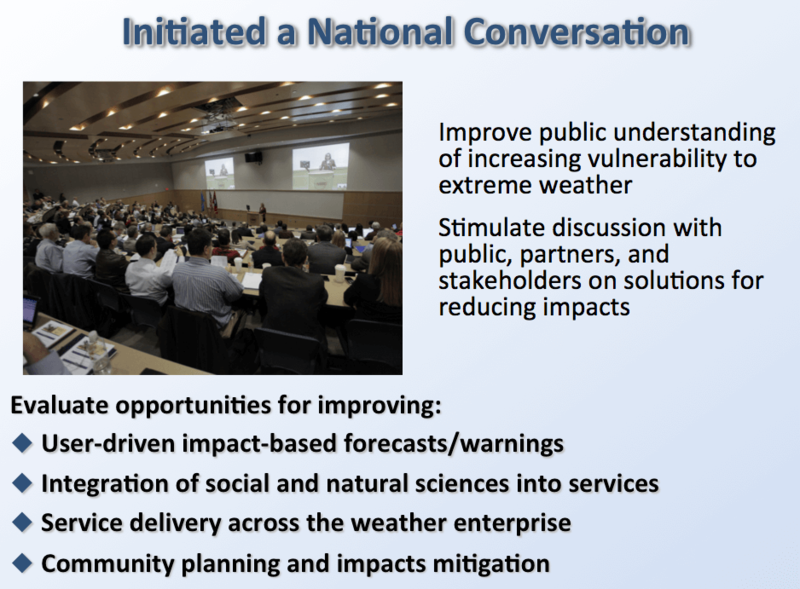 Ultimately, building a successful weather-ready nation requires the cooperation of everyone in the meteorological community, as well as decision makers at various levels of local/state governments, to work together for improved community, business, and personal decision making. To help prepare the public for severe weather, NOAA has built a wide network of government agencies, emergency managers, researchers, the media, and the insurance industry, among others. Partners in these areas will work together to assess the nation’s vulnerability to extreme weather and determine ways to mitigate these vulnerabilities. In addition, as part of the initiative, NWS offices will be able to provide a highly trained and certified meteorologist during major weather events to give briefings. Other improvements will include public briefings about how the predicted weather will affect them (impacts), by providing better explanations of forecast variance and probabilities, mapping flood threats, improving the distribution of weather information through new communication technologies, such as social media. The goal is to improving overall preparedness via widely disseminated messages to the public not only about the forecast, but also about the anticipated impacts, decision support, preparedness, and ways to protect themselves and their families. 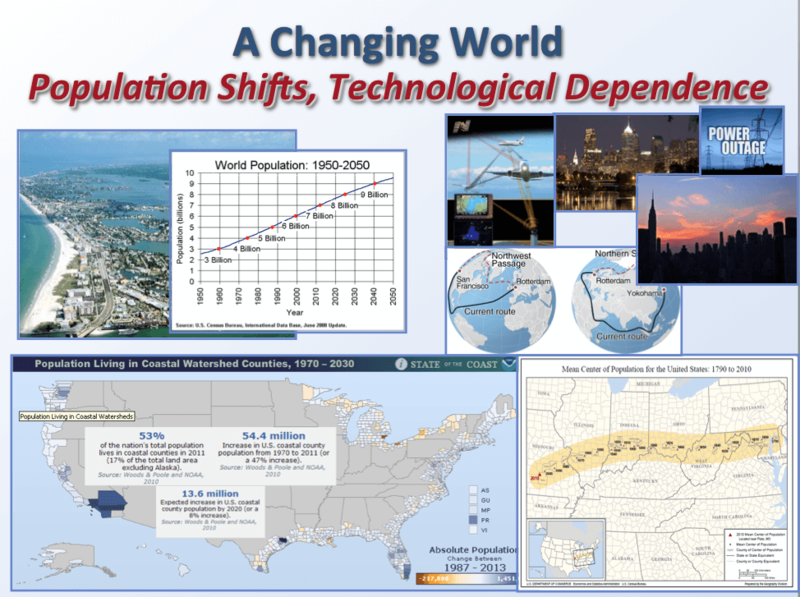 Another component of the Weather Ready Nation initiative is sociology. Forecasters are working with social scientists to improve communication between forecasters, emergency managers, and the public. Through this research, the National Weather Service is altering the language in their weather warnings to focus on impacts, which will help the public understand the risks and make better decisions to protect lives and property when dangerous weather threatens. Over the past year, I have worked hard to educate the public on all of those issues. Of course, overcoming myths (point #3) will always be a daunting task; after all, some well-respected meteorologists in the media are often the first to surmise that “the ground is warm, so the snow will melt”. I refer you to one of my recent articles that tackles this myth head on. In the South, some of our biggest snowstorms have occurred with temperatures above freezing for the three weeks leading up to the event. Many of those events are considered “warm snowstorms” based on their microphysical properties. However, they can cause enormous snowfall rates (rapid accumulation) and/or may be accompanied by a very rapid drop in surface temperature as we saw in Snow Jam ’83 and in Snow Jam ’14 (owing to low surface wet-bulb temperatures and sublimative/evaporative cooling). In the 2014 event, temperatures dropped as much as 10 degrees within the first 60 to 120 minutes after the snow began leading to a rapid freezing of melted snow on the roadways. So, I propose that we get rid of the clichés; the “ground is warm” adage is valid only when the snowfall rate is equal to or less than the melt rate and/or temperatures are above ~28º. I’ve also encouraged the public to focus on the snowfall amounts predicted for their communities, not the amounts predicted for adjacent counties (unless they must travel to those areas or have family/friends that they need to be concerned about). If two inches of snow is predicted for your county with temperatures in the mid 20s, what impact will that have on your community? Never mind that 7 inches may be predicted to accumulate just 20 miles to your south; don’t conclude that “the storm is passing to our south”. This was the conclusion drawn by many people in the Atlanta metro prior to Snow Jam ’14. Let’s approach winter-storm impact messaging in a way similar to a hurricane forecast. The National Hurricane Center always explains that the storm is large and that you should not focus on the precise location where the eye makes landfall; impacts will be felt for hundreds of miles either side of the eye. The same is true for winter storms: they impact large areas, often with a variety of precipitation types, and yes they typically have “swaths” of heavier accumulations; but the impacts will be felt in areas far from those swaths — even areas that receive just an inch of snow or a small glaze of freezing drizzle. One of the goals of the NOAA WRN program is to focus on impacts, and Snow Jam ’14 is a perfect example of impact-based forecasting and decision support. The National Weather Service office in Atlanta did an outstanding job with that storm; we just need to work together as a team to help the public understand the impacts as well as the watch/warning/advisory products the next time a storm like that threatens the South. Since that storm, the National Weather Service offices in the Southeast have made a valiant effort to blend their local criteria in order to simplify the messaging, mitigate alert-type differences at the CWA (County Warning Area) boundaries, and to make inter-office forecast coordination more efficient. They have also stressed that an Advisory is an UPGRADE to a Watch, which was a point of confusion for many when the Winter Storm Watches were upgraded to Winter Weather Advisories. All of this represents just one example (albeit a complex example) of the concept of impact-based forecasting and demonstrates the ways in which the National Weather Service and private-sector organizations like iWeatherNet are working together to improve alert messaging, stress the anticipated impacts, elucidate advisory types, and assist local communities with preparedness and decision support. As a professional, private-sector meteorologist, I strive to provide outstanding forecasts, work with the National Weather Service to bring coherent and consistent life-saving information to the public, relay all official watches, warnings, and advisories, and will continue to create educational content designed to help build a Weather Ready Nation. iWeatherNet is a relatively new organization, but it is growing rapidly. The website is a “work in progress”, and I strive to strategically add new, educational, and seasonally relevant content. As we enter into severe weather season, more information about severe weather and flash flood safety will be added to the website. Likewise, during the cold season, I beef up the content for winter weather preparedness. This is the iWeatherNet commitment as a NOAA Weather-Ready Nation Ambassador. Billion-Dollar Disasters in 2014 – Were You Ready? 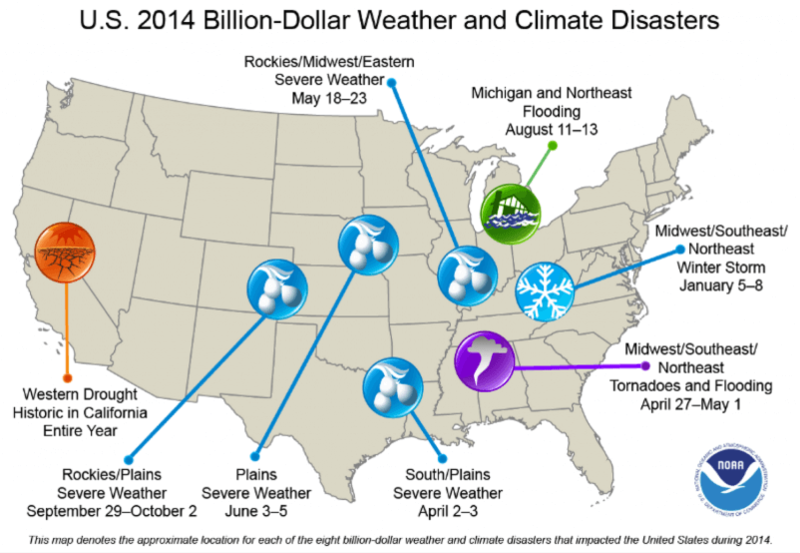 In 2014, there were eight billion-dollar weather disasters in the U.S. These included snowstorms in the Midwest and Southeast, flooding in Michigan, severe thunderstorms across the Rocky Mountains, Plains, and Midwest, tornadoes in the Midwest and Southeast, and of course the historic, ongoing drought in California. If we take anything away from this discussion about the Weather-Ready Nation initiative, it’s that you should be prepared at all times and be ready to act when a disaster threatens. Learn about weather myths. For example, do not open windows during a tornado! Credit: Some images were created by the NWS and modified for the purposes of this article. Tagged history of meteorology, NOAA/NWS, Weather-Ready Nation.